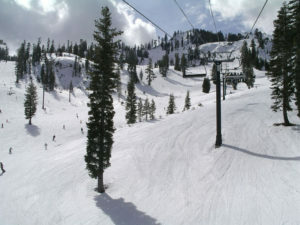 Alpine Meadows is wide open and wild, with 80% above tree bowl skiing. Ski Alpine is where the locals go, there’s no slope side lodging, and the best terrain is out of bounds and legal with Alpine’s rather liberal backcountry policy. 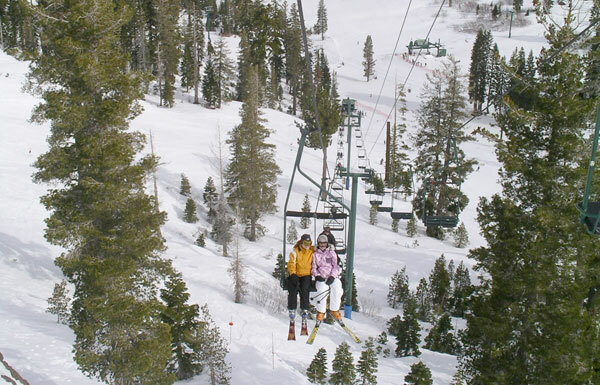 Alpine Meadows is a multi-faced mountain, offering steep chutes lined with jagged rock cropping and snow filled gullies on the front side, then sun-soaked bowls and views of Lake Tahoe on the backside. Since its merger with next door Squaw Valley, Alpine Meadows has been getting some alpine love (okay $$) and now has a new mile-long terrain park -The Firing Line with some of the biggest jumps in Lake Tahoe if your kids are up for that. 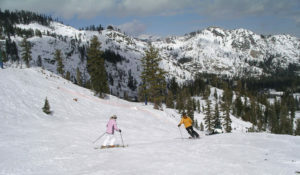 The two resorts are now called Squaw Alpine. Still Alpine holds onto its charm and authentic vibe. Check out Alpine’s mid mountain Chalet – a great spot for lunch a warm up of homemade lunch, or a place to sit and soak up the California sunshine on the huge outdoor deck. Stop at the River Ranch Lodge down the access road for après ski in a family friendly place with views of the beautiful Truckee River below. Alpine Meadows is now on the same ticket as nearby Squaw Valley, a free shuttle transfers skiers and riders back and forth. Look for more improvements to Alpine Meadows, including a Squaw to Alpine transport gondola, part of a resort renaissance with a total of $70 million to be invested here and at Squaw Valley.